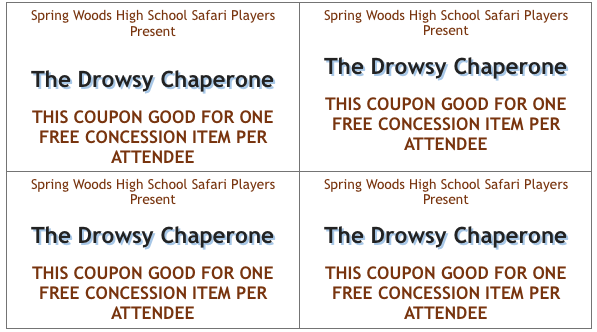 The Spring Woods High School Safari Players is proud to present Tony Award-winning musical “The Drowsy Chaperone,” January 25th, 26th, 28th and February 1st, 2nd, including 2 matinee performances. Opening night on January 25 includes a special opportunity for audiences to meet with the cast during “Cookies with the Cast” after the show. The Man in Chair, a mousy Broadway fanatic, seeking to cure his ” sadness,” listens to a recording of a fictional 1928 musical comedy. When he plays the record of his favorite show, The Drowsy Chaperone, suddenly the cast appears, launching into song and dance. This hilarious musical-within-a-comedy, a parody of 1920s entertainment, features an ensemble cast well-suited to the talented students at Spring Woods High School. The musical features the tale of a pampered Broadway starlet who wants to leave show business to get married, her producer who sets out to sabotage the nuptials, her chaperone, the debonair groom, the dizzy chorus girl, a Latin lover and a pair of gangsters who double as pastry chefs. “The Drowsy Chaperone” has something for everyone—dancing, singing, live music, and, of course, fantastic comedic acting from a talented cast of local students. The cast and crew are working tirelessly to provide audience members a great theatrical event! With tickets only $10 for adults, $5 for students, and free for STAR card holders, this production is an affordable, family-friendly and entertaining opportunity to support the Spring Branch community and its high school students. Plus, as a bonus, print and bring the coupons below for one free concession item per ticket! Friday, Jan. 25 at 7:30pm – Cookies with the cast after the show! Print or save the image above to redeem. This post was submitted through our “Share a Story” program. Do you have any exciting news that Spring Branch should know about? Click here to share your story with our team and we might just post it. Disclaimer: We can’t publish everything we get, we wish we could, but we can’t. Thank you for understanding!